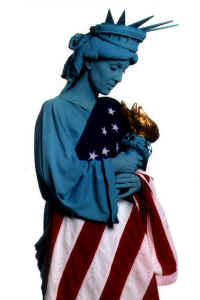 Living Liberty raises funds on behalf of September 11. Freedom of speech and expression -- everywhere in the world. Freedom of every person to worship God in his own way -- everywhere in the world. Freedom from want -- everywhere in the world. Freedom from fear -- anywhere in the world." Sadly, on September 11, 2001, my firehouse in Brooklyn Heights, Engine 205/Ladder 118, lost 8 of 11 men that day. My thoughts continue to be with the victims, families, and rescue workers whose lives were affected by that terrible tragedy. I applaud the valiant firefighters, policemen, and citizens who helped to rebuild New York City, the greatest city on earth. Together they made a difference. Living Liberty's personal account of September 11th.